Emily Callaci. Street Archives and City Life: Popular Intellectuals in Postcolonial Tanzania. Duke University Press, 2017. 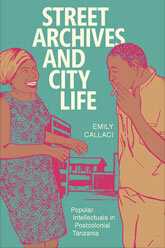 In Street Archives and City Life Emily Callaci maps a new terrain of political and cultural production in mid- to late twentieth-century Tanzanian urban landscapes. While the postcolonial Tanzanian ruling party (TANU) adopted a policy of rural socialism known as Ujamaa between 1967 and 1985, an influx of youth migrants to the city of Dar es Salaam generated innovative forms of urbanism through the production and circulation of what Callaci calls street archives. These urban intellectuals neither supported nor contested the ruling party’s anti-city philosophy; rather, they navigated the complexities of inhabiting unplanned African cities during economic crisis and social transformation through various forms of popular texts that included women’s Christian advice literature, newspaper columns, self-published pulp fiction novellas, and song lyrics. Through these textual networks, Callaci shows how youth migrants and urban intellectuals in Dar es Salaam fashioned a collective ethos of postcolonial African citizenship. This spirit ushered in a revolution rooted in the city and its networks—an urban revolution that arose in spite of the nation-state’s pro-rural ideology. Intro to Street Archives and City Life (pdf) made available courtesy of Duke Press.